A fortnight after Jackie Stewart's victory at the Nurburgring, the F1 teams gathered again at the Osterreichring with Emerson Fittipaldi needing a good result to get back into contention in the World Championship having been pushed back to third by Francois Cevert's second place in Germany. Having missed the two previous races Ferrari was back in action with major revisions to the 312B/3 but a disillusioned Jacky Ickx was missing and so only one car was run for Arturo Merzario. There was bad news for the Austrian fans as Niki Lauda was out of action after breaking his wrist in Germany. BRM did not replace him for the event. Ensign was back in action, having made major modifications to the car and Tecno also had a new car (this one designed in Italy). It was a disaster. Harvey Postlethwaite had done some serious modification to the Hesketh March. The factory March team returned with Jean-Pierre Jarier driving but the team no longer carried any backing from STP. In qualifying Fittipaldi took pole (having now recovered from his ankle injuries) and his Lotus team mate Ronnie Peterson was alongside him on the front row. The second row featured the two McLarens of Denny Hulme and Peter Revson while the third row featured Carlos Reutemann (Brabham) and Merzario. Stewart was seventh on the grid, alongside Carlos Pace's Surtees while James Hunt (Hesketh March) and Francois Cevert (Tyrrell) completed the top 10. At the start Peterson went into the lead with Hulme grabbing second from Fittipaldi. Revson failed to get off the line and this caused some bumping in the midfield and oil being put down on the track by Mike Beuttler's damaged March. Merzario was fourth with Stewart, Reutemann and Pace following. On the fourth lap Stewart was able to pass the Ferrari. Cevert made up for the delays at the start and was soon challenging Merzario but on the sixth lap the two cars collided and Cevert was forced into retirement. Reutemann then challenged Merzario and managed to get up into fifth, although this soon became fourth place as Hulme dropped away, having to pit to have a plug lead reconnected. 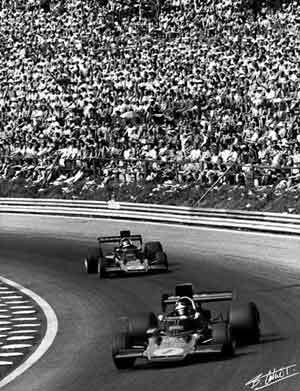 Fittipaldi was up to second and a few laps later he was waved into the lead by Peterson. There he stayed until lap 49 when the Lotus suffered a split in a fuel pipe and the Brazilian had to stop. That put Stewart into second place behind Peterson while Pace had moved ahead of Reutemann and was third. Stewart's six points left Fittipaldi with a deficit of 24 points with three races remaining. It was virtually an impossible task.